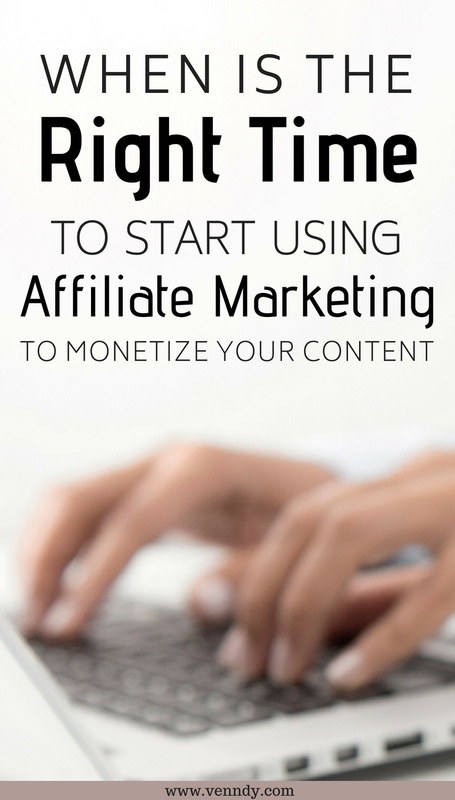 When is the Right Time to Start Using Affiliate Marketing to Monetize Your Content? One of the much-debated questions relating to affiliate marketing is when should you join and sign up to affiliate networks or programs? Should you first build up your traffic and only then start monetizing, or should you start monetizing regardless of your blog size? As there are quite a few networks with no traffic requirements for signing up (i.e., number of page views or followers), we have tried to sum up the pros and cons for your consideration: Some say join from day one, if you do it the right way, you’ll lose nothing, and you’ll set your focus in a way that will help you improve and eventually enjoy the outcome. Others say, why start early? Anyway no one will click on your links if you don’t have enough traffic, so you should wait until you have a stronger base of followers. Well that is the short answer…but now for the long answer! It actually depends… on your intentions, your willingness to be consistent, and your determination to earn money form your digital content. The good news is that digital content is not only blogging, which can be tedious and time- consuming. There are many more channels (Instagram for example) through which you can grow your influence and monetize your content and reach. You may not have many page views on your blog, you may not have a blog at all, but you may have a few thousand followers on one or more social media platforms. Your digital presence includes of all the followers of your blog, social media, and any other platforms you may contribute to (even reviews on social platforms or retail sites). 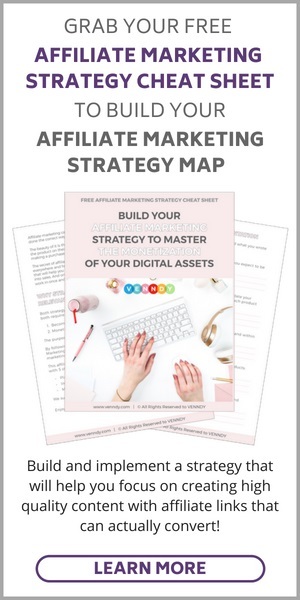 So, if you are in it for the long haul, whatever content you create and wherever you share it, this can become your digital "asset” and you can monetize it. There are no drawbacks to becoming an affiliate in any of the networks that accept beginners, except for a time limit for making a sale (see below) that are demanded by some of them. As long as you are planning to post consistently on a blog or on other platforms, you had better start treating it as a source of income as soon as you’ve set up your account or blog. Pros – You don’t need a ton of traffic. Your earning is not based on the page views of your blog or website. Sure, you need eyeballs on your affiliate links, but with the right strategy you can make affiliate sales from your small but targeted audience. What’s more, statistics show that micro-influencers have higher conversion rates than those with larger accounts on social media. There is a good reason for this: the smaller your following, the larger the engagement and familiarity between you and your followers. So you don’t necessarily need thousands of followers to make a sale. Rather, you need to know who you are writing to, so you can offer the kinds of products that your readers just have to have. Cons – No traffic no sales. It is true that there is no magic way to convert your affiliate links into sales. If you have a lot of traffic coming to your site and the right kind of audience who are interested in what you have to recommend, then you are more likely to make a sale. If, however, you’ve just started and you don’t have any traffic coming to your blog or social media yet, then you’re not likely to get any clicks, much less any purchases, through your affiliate links. And getting traffic can be hard when first starting out. Pros – The sooner you treat your blog or website as a "business” the better. The days are long gone when people started blogging as a creative outlet or self-expression and then found out they could turn their passion into a full-time income. True, it is harder to make money as a beginner, but the clearer you are about your desired outcome, the greater your chances of getting there. As the influencers’ industry flourishes, there are more ways and tools even for beginners to think and utilize monetization strategies. Say, for example, you share on a blog or on Instagram a destination, an event you experienced, or an outfit you put together. Each of these experiences comprise different items that shaped it and made it what it was (the hotel, the clothes, the places, the services). By breaking them down into separate recommended items and creating a clickable, shoppable collection, you bring additional value to your readers and make it easy for them to find, save, and shop. You can then share this same experience as a shoppable carousel on your blog, Instagram, on Pinterest, and on other platforms. Cons – The risk of being kicked out of the network/program. Some of the networks have a time limit: a certain number of sales must be made through their affiliate links within a certain period. For example, Amazon Affiliates will close your affiliate account, if you haven’t made at least 3 sales within 6 months of joining. But 3 sales is not such a big deal, as long as you have some kind of following. Some companies may let you reapply later on once your traffic has increased. But some will not. One way to go is to start only with the affiliate networks that are less strict with their rules and easy to apply to and get approved, such as ShareASale, Booking and Awin. Pros – Don’t put all your eggs in one basket. By trying different programs and starting to utilize affiliate links and your channels, you’ll get better at it. By the time you are approved by programs that do have traffic requirements, you’ll be more familiar with what works and you’ll have learned how to pick the best products for your audience. Signing up to one of the sub-affiliate companies for pay per purchase programs (such as RewardStyle or ShopStyle) first requires minimum traffic and second doesn’t give you maximum flexibility over your content. Yes, it’s easy, as it is just one sign-up, but you get no transparency with retailers and brands in terms of relationships and commissions. If something happens to the sub-affiliate or to your relationship with them, you are doomed. Using a combination of programs and networks make sense in so many ways and is definitely something to consider. Cons – You will need to cope with rejection. Although signing up to the affiliate networks is quite easy, you will probably still get some refusals from the programs they offer once you apply. For example, you may be signed up to Rakuten but ShopBop, which runs the affiliate program within Rakuten, may not approve you if your blog or social accounts don’t have enough traffic. Getting these refusals can be a blow. But don’t worry, there will be others to approve you, and when you get a bit bigger, you can try again. Pros – Build your stream of passive income. 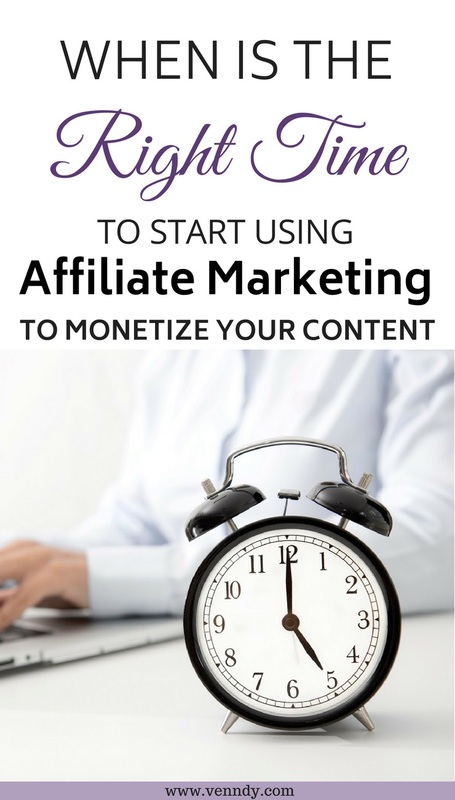 Monetizing with affiliate marketing can take time, repetition and practice. It is not a quick way to make money. But with time you can make money while you sleep. Therefore, it is beneficial to start implementing a proven strategy and share your affiliate links in your blog posts, social media, and emails from the very beginning. You will learn which program pays better commissions (some offer up to 50%) and which products best suit your audience. Cons – You will turn off your audience. Same say that using affiliate links, like any sort of paid promotion, raises the question of trustworthiness and authenticity. As building an honest and trusting relationship with your followers is a crucial part of your success, monetizing might be seen to scare away people, making you seem like a salesperson, and thus jeopardizing your potential traffic growth. Pros – Once you start and improve, it will get better. Yes, this requires a learning curve. It might be easier to wait and sign up to one of the sub-affiliate companies that are by invite only and require traffic. The advantage is that you sign up once and they’ve already gathered a variety of affiliate networks and brands for you. The same goes for automated tools for inserting revenue-generating hyperlinks such as Viglink or SkimLinks. These automated tools, though easier, may be helpful for less personally engaged publishers, but for an influencer sharing her own experience, it might raise questions of trust and engagement. With the growing number of businesses offering affiliate programs, taking the leap and learning how to master affiliate marketing through your choice of affiliate networks will give you the freedom to be creative and to mix and match programs through either one of the well-established networks or individual programs. Cons – Affiliate marketing is a skill that must be mastered. Affiliate marketing requires learning a new skill, and when you’re just starting out, this may distract you from all the other things on your to-do-list. It is not so much about inserting affiliate links as about being mindful and offering the right products to the right audience; if you simply throw around products and links with no background story and reasons for your recommendations, you’ll end up with very few results. Some may say that if you wait until you are a more experienced influencer, adding affiliate links will be a whole lot easier, as you’ll have a clearer view of your niche and a solid understanding of what works well with your audience. Pros – You plan for the long run and use presentation tools which will grow with you. Thinking in terms of clickable shoppable items from the very beginning will help you bring greater value to your followers. Social influence is not only about inspiration but also about practical advice. Take Instagram for example. If you don’t think of it from the very beginning as a tool for referring others to products they can use and places they can shop or visit, you are "losing” a valuable opportunity to catalog all your content from day one. This might just be a chicken and egg example that will help you grow. Cons – You risk wasting your time and will need to remove all the irrelevant affiliate links. If you do end up having to do this because you haven’t made any sales (such in the case of Amazon), it can be a massive headache. As these links will not earn you any money, you may want to remove all the affiliate links that are still active on the company’s site. If you are concerned about making the required sales, you should only pick programs with maximum flexibility (such as ShareASale) and join others only when you feel you are ready. 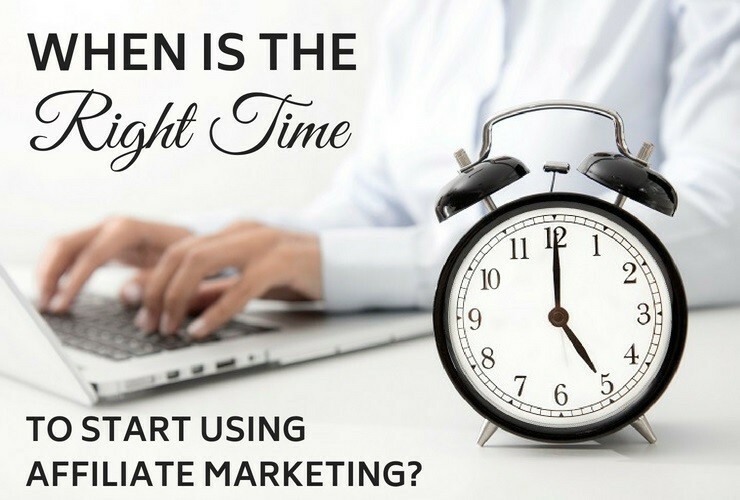 We hope this has helped to clear up the question of when is the right time to start using affiliate marketing on your website and social media. We speak from experience, as we built VENNDY, a monetization tools platform which is aiming to help bloggers and influencers to use affiliate marketing to start monetizing their content from the very beginning. We believe that influencers should be compensated for their creative content when helping others make better, easier, and more personalized choices. Of the many monetization methods used by digital publishers, affiliate marketing is the one that most supports trustworthy relationships. With VENNDY you curate each product once, add your related affiliate link when the time is right, and share it across all platforms. You can always go back and add, change, or remove affiliate links as needed. 1. Traffic – There are two ways to address the challenge of traffic. Based on the idea that we’re better together, VENNDY forms a user-curated collaboration hub where the content of many helps the individual contributors be discovered and grow. But even on the level of the single influencer, even just the mindset of focusing on bringing easy-to-find content to your followers can make a difference by increasing engagement and traffic. 2. Timing – With VENNDY’s tools you don’t need to wait to join new programs, be invited, or be approved. You start slow with the programs that welcome beginners and grow gradually, steadily add more and more products and items. By using VENNDY’s tools you can arrange all of your experiences into categories and items from day one, and even if you decide to postpone adding affiliate links to a later stage, you can still go back later and add affiliate links to all your older posts across channels. Learn how to use the VENNDY’s Link Collector HERE. Make sure to read our blog posts on How to Monetize your Instagram Feed by adding clickable, shoppable links, and How to Monetize on Pinterest in a way that will help you become a trusted influencer. 3. Diversity – With VENNDY you can focus on the products, places, and services you want to offer your audience. The best way is to start with products that you love and are happy to recommend to others. Think of a product you want to recommend to a close friend or family member. Then check out its affiliate program on its site, or simply Google "brand/product name + affiliate program” and you will often be guided to the relevant program to join. This way you can join as many networks and programs as you need while keeping your "digital assets” close to your chest. You have full transparency on commissions and full control on relationships with the brands, and you also get the analytics, reporting, and payments made by top-ranking reputable networks. It doesn’t get better than that! 4. Monetization – The whole purpose of online connections and the wisdom of the crowd is to get people to share their experiences. The sharing thing all started from a desire to use one’s experience to help others. When done the right way, with a genuine intention to share finds and with absolute transparency about personal experiences with the product (for good and for bad), your readers will be eager to hear what products you are interested in. Assuming you give them valuable information – to which they would probably not be privy if not for your exposure – they will have no problem making purchases through your affiliate links. For more on how to create a reliable experience, read How To Make Affiliate Marketing Work and Succeed as an Affiliate in Any Niche. 5. Ease of Use – When using VENNDY you don’t need to spend time learning all the promotional material, banners, and codes of the different networks. You only need to learn how to use one tool, and once you have installed the link generators of the various affiliate networks, you insert the link to VENNDY Link Collector and produce your presentations for your website and social media. 6. Presentation – When using VENNDY, if, at the very worst, you don’t reach the required quota of sales within the given time frame, you can just go back and remove the products or the affiliate links or simply edit them from within VENNDY item’s page. Just click EDIT and delete the link. Is now the right time for you to start monetizing with affiliate marketing? Do you have any insights or recommendations to share with us? How to Monetize With Custom Built Carousels Using Your Choice of Affiliate Networks and Programs?